It’s always fascinating to know about a chapter of history which is forgotten but holds an important place. In the past, we have seen with films like AIRLIFT , NEERJA  and the recently released GOLD which spoke about heroic instances and all these films were lapped up by the audiences. Now, J P Dutta, known for his war films, is back with PALTAN. After BORDER  and LOC: KARGIL , J P Dutta completes his war trilogy with his latest flick which also enlightens viewers about something that they should be proud of. So does PALTAN succeed in giving the viewers an exhilarating time? Or does it disappoint? Let’s analyse. PALTAN tells the story of a military clash between India and China in 1967. This is a time when the state of Sikkim isn’t a part of India. China wants to capture it by hook or by crook for strategic reasons but due to international pressure, they can’t make their intentions public. Yet, at Nathu La border in Sikkim, they keep engaging in minor skirmishes to scare the Indian forces which are stationed there after the king of Sikkim granted them permission. Maj. Gen. Sagat Singh (Jackie Shroff) appoints Lt. Col. Rai Singh Yadav (Arjun Rampal) as the in charge of Nathu La. Rai has undergone training in London and is well versed with Chinese tactics. Some of the officers under him at Nathu La are Major Bishen Singh (Sonu Sood), Captain Prithvi Singh Dagar (Gurmeet Choudhary), Major Harbhajan Singh (Harshvardhan Rane), 2 Lt. Attar Singh (Luv Sinha), Hawaldar Lakshmi Chand (Abhilash Chaudhary) etc. Frustrated with the constant harassment by Chinese, Rai recommends that a permanent fence be laid down dividing the Indian and Chinese border. This would stop the regular fights between the forces of both countries over where exactly the border line is. Work on the fencing begins on the Indian side and it rattles the Chinese as this would put their plan of capturing Sikkim in jeopardy. With no other option in hand, the Chinese forces open fire and a war breaks out between the two countries. What happens next forms the rest of the film. J P Dutta’s story is based on real life incidents and he tries his best to keep it as authentic as possible. J P Dutta’s screenplay is engaging. Even in the repetitive scenes, one doesn’t get bored. J P Dutta’s dialogues are simple and sharp. But there are far too many famous quotes mouthed by actors every few minutes. J P Dutta’s direction is topnotch. Often, filmmakers who shined in the 80s and 90s are not able to move in with the times, a recent example being of Anil Sharma who directed GENIUS. But J P Dutta takes care of this bit and ensures the audience of today will be interested in the film. At the same time he has kept his sensibility intact. He however should have not let the proceedings to be stretched and should have avoided scenes similar to BORDER. But he executed the war scenes like a pro. Also he ensured the audiences can feel the tension at the border. PALTAN is two and a half hours long and takes a long time in the build up. The war commences only in the middle of the second half and that’s when the film truly shines. Before that, the film has its moments but not in entirety. One of the most heartbreaking sequences of the film is in the beginning showing a postman delivering the telegram to several houses in a neighborhood and thereby informing them of the demise of their family members in the 1962 war. The manner in which the postman nonchalantly delivers the telegram and cries can be heard in the background is quite chilling. After the story shifts to 1967, the film continues to be engaging. But it gets repetitive. There are far too many sequences of the Chinese soldiers arguing with the Indians. Also some amount of time is devoted in throwing light on the personal lives of the soldiers and their lovers. It is interesting but it has a BORDER hangover. The war sequence however is sans complaints. It is heroic and would surely induce claps and whistles. Also the scene of the family members receiving the remains of the soldiers will put a lump in your throat. Jackie Shroff is in a supporting role and does fine. Some of his English dialogues in the beginning are a bit difficult to comprehend. 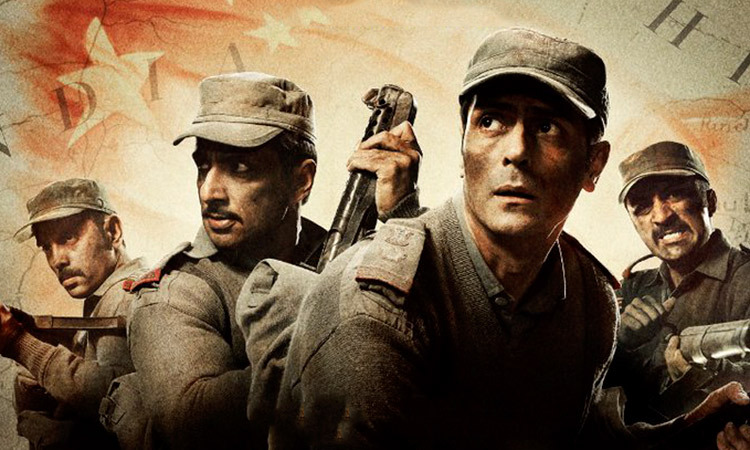 Arjun Rampal plays the main officer in charge of the border and he nicely plays his part. The way he shows aggression but also knows when to restrain himself is impressive. Sonu Sood is a natural and adds a lot to the film. Gurmeet Choudhary leaves a huge mark with his humour, temper and also his romantic side. Harshvardhan Rane also delivers a stupendous performance and looks perfect as the angry young Sardar. Both Gurmeet and Harshavardhan are going to receive maximum applause and whistles in the finale! These two young actors get a chance to show their true potential in this film. Siddhanth Kapoor gets limited scope but is memorable as he plays the interpreter. Luv Sinha is alright but gets to show his worth in some very important scenes in the 2nd half. Abhilash Chaudhary and Nagender Choudhary get very limited scope. Rohit Roy (Major Cheema) is wasted. As for the actresses, Monica Gill (Harjyot) gets the maximum scope followed by Dipika Kakar (Captain Prithvi Singh Dagar’s fiance) and both are nice. Esha Gupta (Lt. Col. Rai Singh Yadav’s wife) is hardly there while Sonal Chauhan (Major Bishen Singh’s wife) appears only for a few seconds in a song. Anu Malik’s music isn’t of chartbuster variety but works for the film. The title track is average and ‘Raat Kitni’ is forced but somehow works. ‘Main Zinda Hoon’ generates the most impact. Sanjoy Chowdhury’s background score is dramatic and adds to the excitement. Nigam Bomzan and Shailesh Awasthi’s cinematography is breathtaking and has captured the locales beautifully. However in terms of authenticity, the film falters a bit as they have tried to recreate Sikkim in Ladakh and obviously the topographies of both regions are different. Amrish Patange and Dayanidhi Patturajan’s production design is very real. The huge billboard of Mao Zedong creates an impact. Sham Kaushal’s action is terrific and makes the war scenes so real but at the same time he avoids gore. Ballu Saluja’s editing is appropriate. VFX however is could have better at a few places. On the whole, PALTAN not only enlightens viewers about a lost chapter in history but also entertains viewers while doing so. Though the buzz is limited, a good word of mouth can definitely help the film.